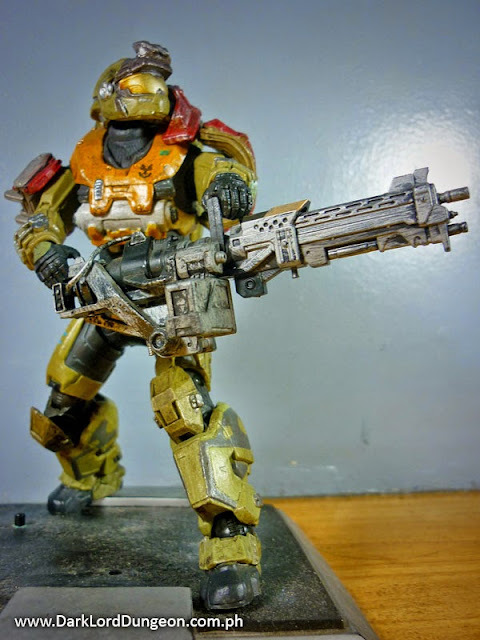 Presenting McFarlane Toy's Spartan Jorge 052 - Noble 5 - from the HALO Reach video-game. Chief Warrant Officer Jorge-052 was a member of the SPARTAN II program - the same program that produced the Master Chief. SPARTAN Jorge was one of the few SPARTAN II survivors who got assigned to work with SPARTAN IIIs. He served with Noble Team as their heavy weapon's specialist with the designation Noble 5. As a member of the SPARTAN II program, Jorge received the same genetic augmentation and training that the Master Chief received. This made him stronger, than the members of the SPARTAN III program - who were just armor enhanced elite soldiers. SPARTAN Jorge was killed during Operation Uppercut during the Battle of Reach. He was the first member of Noble Team in the HALO: Reach game to die. Fearing that they would lose the battle thanks to the arrival of a Covenant Supercarrier, Noble 5 and Noble 6 infiltrated the Supercarrier to deliver a slipstream bomb. Unfortunately their escape options were cut off and the bomb's timer was damaged. Noble 5 Jorge 052, gave Noble 6 his dogtags and literally picked up and threw Noble 6 off the supercarrier. He stayed behind to detonate the bomb manually. 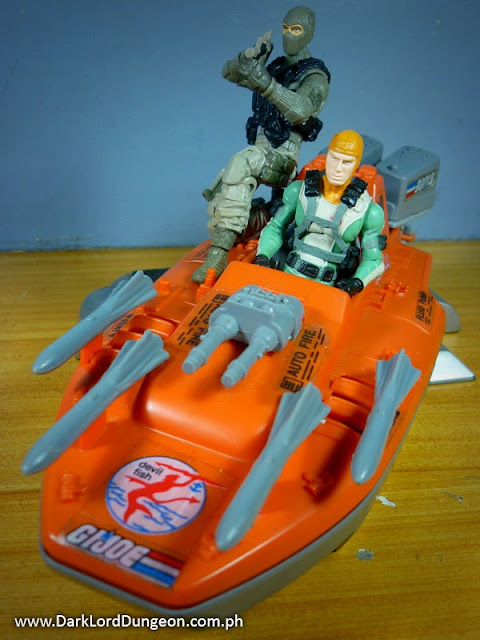 SPARTAN Jorge-052's last words to Noble 6 was "Tell em to make it count"
Presenting the GI Joe Devilfish the riverine warfare and patrol boat of the GI Joe team. The GI Joe Devilfish first made an appearance all the way back in May of 1986 in the Marvel Comic book version of GI Joe. The issue was GI Joe 47, which carried the story-title "Sea Duel"
It was the first and last appearance of the Devilfish in the Marvel Comic books. BUT it was one of the most pivotal issues of GI Joe! "Sea Duel" takes place right after Snake Eyes and Storm Shadow storm Cobra Island in order to avenge the death of the Hard Master by slaying Zartan, the Cobra Master of Disguise. Which they fail to do. Believing that Zartan had fled the island, the two ninjas are now faced with having to fight their way out of Cobra Island. Presenting the Transformers Combiner Wars Ultra Magnus! This is the IDW/G1 continuity Ultra Magnus and not the Ultra Magnus who was robbed of the leadership of the Autobots by Hotrod (Rodimus Prime). Which means that the Combiner Wars Ultra Magnus is the Duly Appointed Enforcer of the Tyrest Accord, and upholder of the Code of Interplanetary Conflict - or so he keeps saying. He also hides a terrible secret: The real Ultra Magnus was a law-enforcer. He's dead. After he died Chief Justice Tyrest believed that the legendary law-enforcer had to continue on given what he symbolized. So he created and released an Ultra Magnus armor that was run by "loadbearers" - a small amount of tiny Autobots who had sparks strong enough to animate the armor. Each time the Ultra Magnus pilot would receive fatal injuries, the armor would return to Tyrest and a new loadbearer would animate the armor. 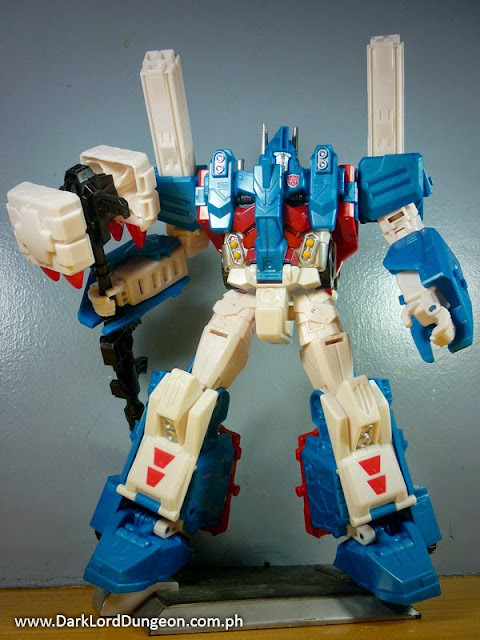 Because of this Ultra Magnus gained the reputation of being "unkillable" as he seemed to have the ability to bounce back from critical injuries. Little did anybody know that four loadbearers had already died in the service of Tyrest. The current pilot of the Ultra Magnus armor is Minimus Ambus - a tiny Autobot who always dreamed of holding the line against the Decepticons in the Great War. Presenting the Star Wars Legacy Edition Millennium Falcon - one of the largest Star Wars playsets in the Dungeon. Luke Skywalker called the Falcon a piece of Junk. Princess Leia called it a bucket of bolts. 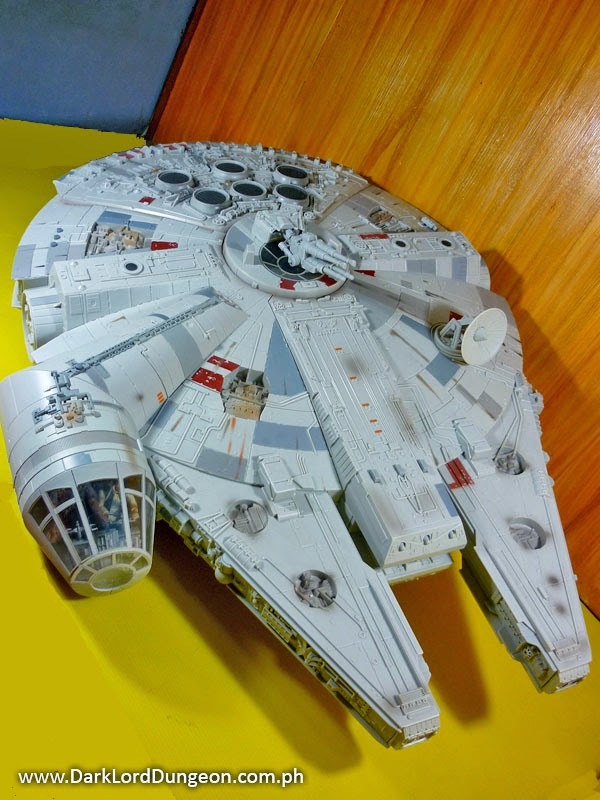 Lando Calrissian, the Millennium Falcon's former owner called it the "fastest hunk of junk in the galaxy." Just what did the Millennium Falcon do to deserve such a decrepit reputation? YT-1300 492727ZED - the original name of the Millennium Falcon, was built in 60BBY (Before the Battle of Yavin - where we all know the Millennium Falcon flew). Fickle Flyer, Meetyl's Misery, Jackpot, Hardwired, Wayward Son, and the Stellar Envoy. The Stellar Envoy was destroyed in a collission with another ship and was rebuilt as the Second Chance, It was later renamed: Gone to Pieces. It was named the Millennium Falcon by a thief who stole it named Zenn Bien who used it in service of the Rebellion in the Galactic Civil War. It eventually ended up with Lando Calrissian who used the ship for smuggling purposes. Calrissian would lose the Falcon in a Sabbac game to Han Solo. 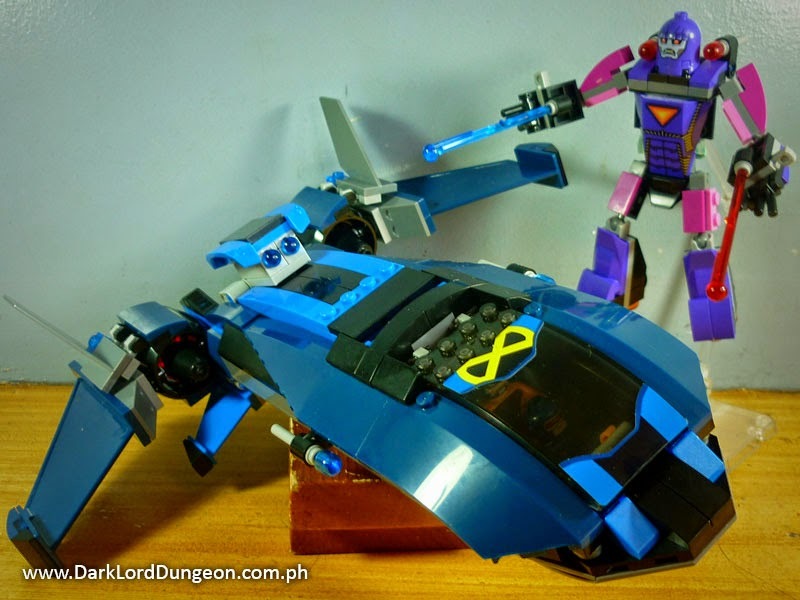 Presenting a Knock-off (KO) version of Marvel's X-Men vs The Sentinel LEGO Playset. In a nutshell, this LEGO Playset features the X-Men: Cyclops, Wolverine, Storm and Magneto flying a Blackbird up against a medium-sized Sentinel. Here's the thing though: We're not sure when this particular scenario would have happened. Magneto - and the way he's dressed - was back when he Headmaster of Xaver's School for Gifted Youngsters (Circa: Fall of the Mutants). The X-Men's Blackbird didn't become a forward-swept-wing aircraft til the X-Men returned to from the Shi-Ar empire along with Charles Xavier and Xavier had Forge redesign the Blackbird. So this could never have happened.